In our Chicken Recipe for Dogs, we use carefully chosen, authentic ingredients for everyday health. An optimal balance of nutrient-rich whole foods to fulfill the unique health needs of your dog, providing whole-body nutritional support to promote complete health. Balanced Natural Nutrition- The perfect balance of protein, fat, carbohydrates and essential vitamins and minerals. Healthy Body Mass- Quality animal protein sources to help build and maintain lean muscle mass. Optimal Nutrient Absorption- We ensure excellent nutrient digestibility through our Digestool® confirmation studies – less nutrients in the stool, means more nutrients stay in the body. Bone & Joint Health- We guarantee calcium levels and add sources of glucosamine hydrochloride and chondroitin sulfate to help maintain healthy bones and joints. Digestive Health- We use wholesome grains and natural fiber to help maintain a healthy intestinal tract, and this recipe contains a source of live, naturally-occurring microorganisms. 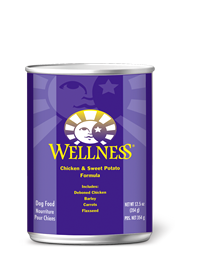 Guaranteed Great Taste- With satisfaction guaranteed, we use deboned chicken and whitefish to provide a taste that dogs love. Available in: 30 lb., 15 lb., & 5 lb. bags. 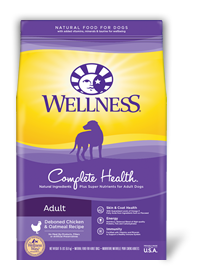 Our Complete Health Natural Food for Pets has added vitamins, minerals & taurine for wellbeing. We’re a family owned company on a passionate mission to raise the bar in pet food and give pets the gift of healthy and happy lives. That means we use the finest natural ingredients, ensure the highest quality standards and create delicious recipes pets crave. In other words, we make sure our passion for pets shines through every aspect of what we do. After all, Wellness is not just our name, but our mission. Look for the 5 Signs of Wellness in your pet! Great nutrition is the foundation of health. When you add in love, play and care, the true signs of wellbeing shine through. Discover the difference choosing Wellness can make. Looking at the chart below, divide the total cups per day by the total number of times you feed your dog per day to determine the portion size for each meal. Keep a clean bowl of fresh water available at all times. 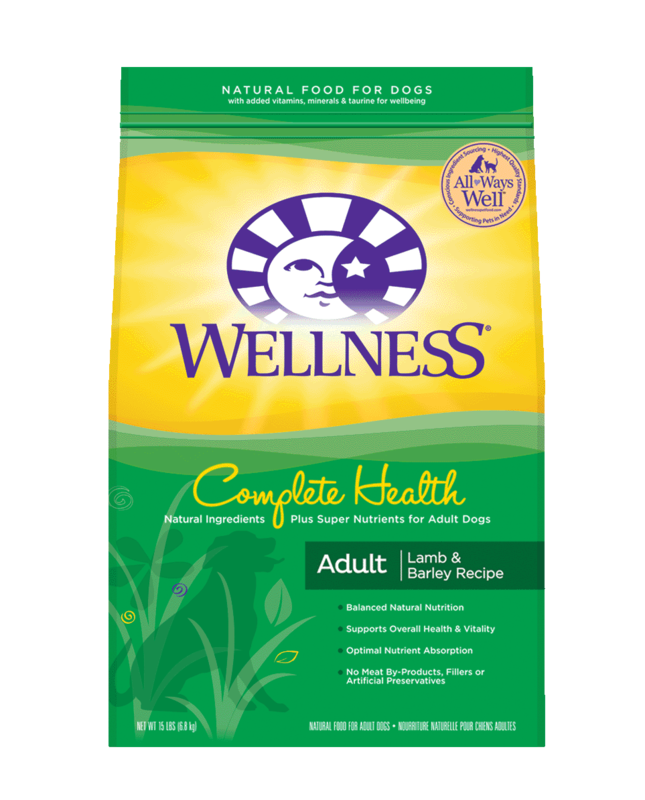 Wellness believes in feeding dry and wet food in combination whenever possible to help increase the level of water in your dog’s diet. Dogs over 125 lbs: Add ¼ cup (30 g) per additional 10 lbs (4.5 Kg). Combination Feeding: If feeding with wet food, reduce dry amount by 1/3 cup (40 g) for every 6 oz (170 g) of wet food. CALORIE CONTENT (CALCULATED): This food contains 3,619 kcal/kg or 434 kcal/cup ME (metabolizable energy) on an as fed basis (calculated).